DCD985 20V MAX hammerdrill with patented 3-speed all-metal transmission and 1/2" all metal ratcheting chuck delivers 535 units watts out of maximum performance, faster application speed, and superior bit retention. DCS380 20V MAX reciprocating saw with 4-position keyless blade clamp allows for quick blade change without touching blade or reciprocating shaft. DCF885 20V MAX 1/4" impact driver features 3 LED lights with 20 second delay to provide visibility without shadows. DCL040 20V MAX LED work light delivers 110 lumens of light output. The charger is EnergyStar qualified for a better environment. 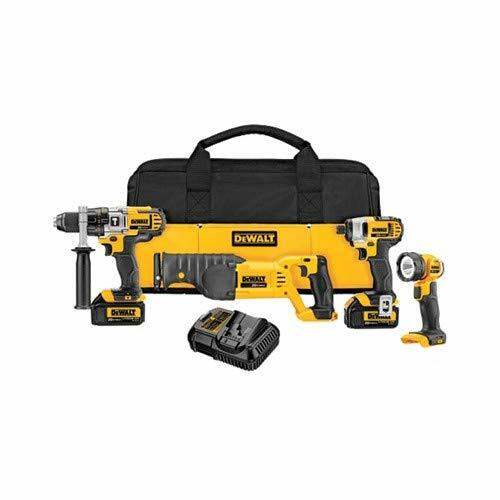 DCK49L2 includes: DCD985 1/2" Hammerdrill, DCS380 Reciprocating Saw, DCF885 1/4" Impact Driver, DCL040 LED Work Light, (2) 20V MAX Lithium Ion 3.0 Ah Battery Packs, Fast Charger, 360° Side Handle, Belt Hook, Contractor Bag.